Well I didn't go anywhere.. I just haven't had a second to upload the pictures on my camera get the videos made edited and uploaded... So much to do and no time to do it. I really need an extra couple of hours in the day. I just don't know if I could stay awake for them HA HA!! Here are a few projects the rest will be posted here in a bit. 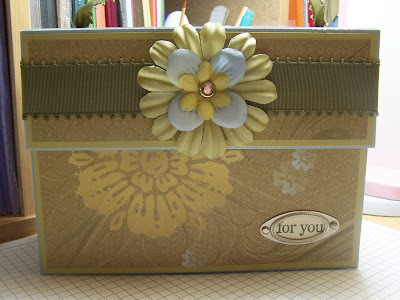 This is the 6x6 Brag Book page I did for my Demo Swap this past weekend. Sets: Independence Day & Jumbo Outline Alpha. Large Star punch, small star punch & 1 inch circle for scallop edge. White grosgrain ribbon. 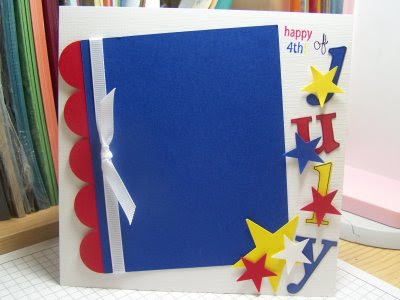 Card stock: Brilliant Blue, Yo Yo Yellow, Real Red & textured Whisper White. Basic Black ink pad & Yo Yo Yellow, Brilliant Blue & Real Red Markers. Next is the Birthday Card I made a few weeks ago for my Upline and Great Friend Terry. Stamp Sets: Boho Backgrounds & Happy Everything. 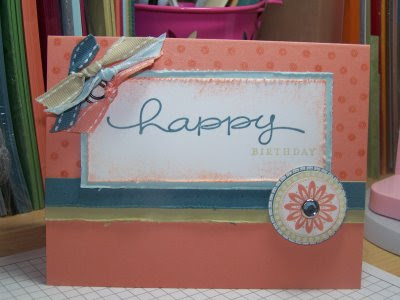 Card Stock: Groovy Guava,Soft Sky, Blue Bayou,River Rock & Whisper White. Cutter Kit,Crafter's tool Kit (paper-Piercing), Inks in the same color of Card Stock. 1 1/2, 1 3/8 & 1 inch circle punches. Rhinestone Brads, Double stitched ribbon in Guava, River Rock, Blue Bayou and Soft Sky. 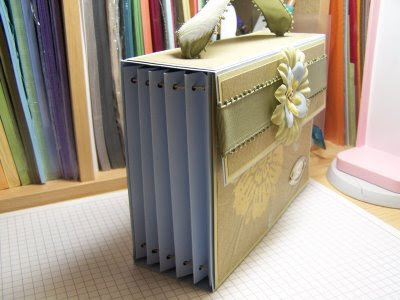 The final project I have for you today is a Card organizer I made. I think it came out gorgeous.. I love the colors. I found the instructions on You Tube here. Stamp Set: One of a Kind. Bashful Blue,River Rock & Le Jardin Designer paper. Pretties Kit,Styled Silver Hodgepodge Hardware,Theater Ribbon Originals, Always Artichoke ink. I love your stuff! The card organizer is gorgeous. I'm glad you posted my birthday card here because I never received it! It's a beauty!!! Thank you.